We are more than just vending! Be sure to ask us what separates us when contacting us! Come and join the growing list of locations. When you become a vending location, it allows your employees, students and patrons to enjoy a variety of snacks, drinks and perishables. Not only that, your business could receive additional income from profit-sharing when you have our state-of-the-art cost-FREE vending machines or micro markets on-site! • Have you been provided a Certificate of Insurance by your vendor? • Have you been listed as an additional insured on their policy? • Do you want to upgrade your existing vending to newer equipment? • Would you like to replace your vending because of bad service, bad selection of products, etc.? • Do your requests take weeks to be responded to, or are not responded to at all? 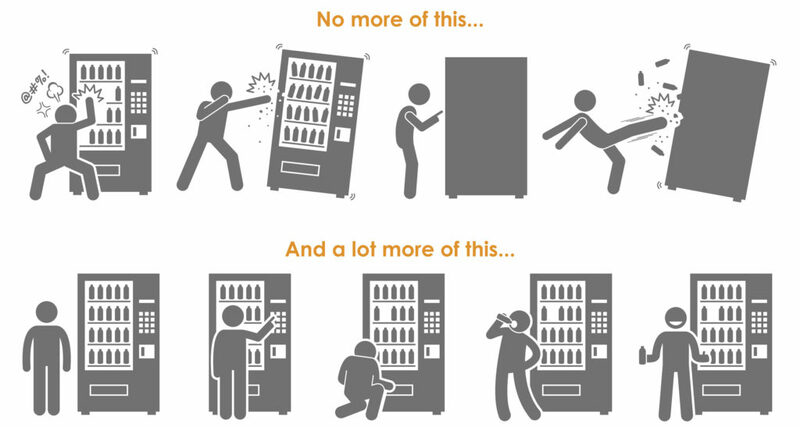 • Does your current vending machine or micro market break down frequently? • Would you like better communication with the company that maintains your current vending machines? If any of these concerns apply to you, we can help! Becoming a vending location is easy. We come out to meet with you to discuss your vending needs, go over our vending equipment, take measurements to make sure our equipment will fit, talk about products, and answer any questions that you might have. Afterwards, if you are in agreement with the placement of a vending machine or micro market, we move forward with the installation. There are no long term contracts involved and everything is 100% cost-free to you. Contact us today at 888-400-2831 or complete the brief form below. We will contact you within 24 hours. Best day and time to contact you.